Today is BIG TICKET DAY at The 2018 PopCult Gift Guide, and our pick is an incredible work of art, literature and storytelling. 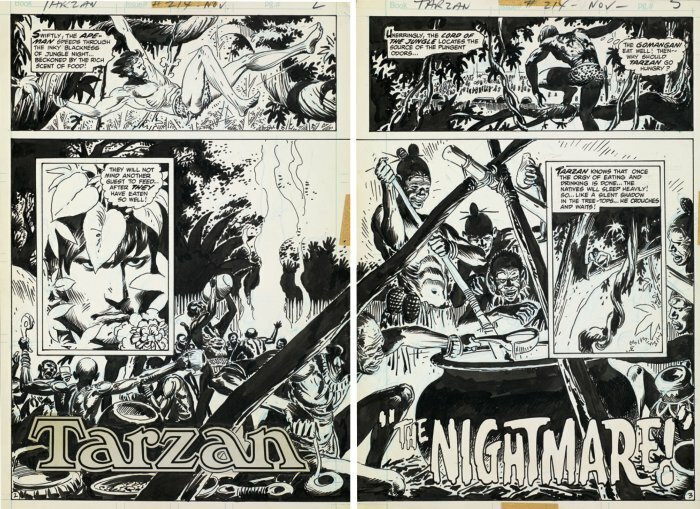 Published in 2012 to celebrate the 100th anniversary of Edgar Rice Burroughs’ most enduring creation, Tarzan of the Apes, this Artist’s Edition book highlights Joe Kubert’s take on the character, which many people (including your PopCulteer) consider the definitive comics adaption of Tarzan. Artist’s Edition is an award-winning line of hardcover reprint comic books published by IDW Publishing. Each page in an Artist’s Edition series book is printed the same size as the original art board and scanned in high resolution from the original art wherever possible. Additionally, while appearing to be in black and white, each page is scanned in color to show blue pencil and other corrections. These remarkable collections are as close as many people will ever get to seeing original comic book art pages. The books are huge. This edition is seventeen inches tall, and a foot wide. This is an impressive gift for any devout fan of Joe Kubert, Edgar Rice Burroughs or comic art in general. Joe Kubert was one of the most acclaimed comic artists ever. His career in comics lasted nearly 70 years. Throughout all those years his hallmarks have been a mastery of sequential storytelling and exceptionally fine drawing. Highlights of his career include work on Hawkman, Enemy Ace, Tor, Sgt. Rock, and the Viking Prince. But of all these exceptional artistic achievements one stands out: his remarkable adaption of ERB’s Tarzan. This incredible work can be ordered directly from IDW Publishing for $125. You may find better (or worse) prices at other online retailers by using your Google machine.